Carol and Arthur Rivers have loved and worked with dogs all of their lives. Arthur has a strong reputation for training security dogs and to this day still provides valuable dog training sessions for dog owners. Carol has also had a successful track record in dog trials and handling. Specialising in large breeds, Carol and Arthur have strong links with South Yorkshire Police Support Dogs. Rivos is the official overflow kennels for the police and have provided training for South Yorkshire personnel and police dogs. Nestled in the peaceful Oxspring countryside in Sheffield, South Yorkshire, Rivos Boarding Kennels has been a family business for the past 20 years and has a solid reputation in the dog world. 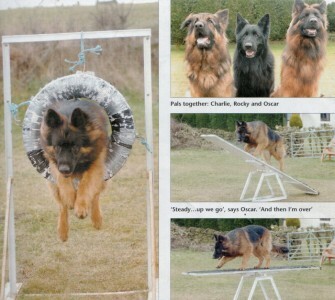 Arthur's skills as a dog trainer has led him to rub shoulders with hollywood stars such as Adam Civico and Lee Boswell. With strong ties to the movie world, Arthur is a master at training dogs for the film industry, the police and for dog owners in the UK. Arthur started out in canine security setting up his own successful business. providing highly trained security dogs throughout the UK. He remains a member of the British Police and Services Canine Association and the National Association of security dog users. Arthur has won awards from both of these organisations in the past.